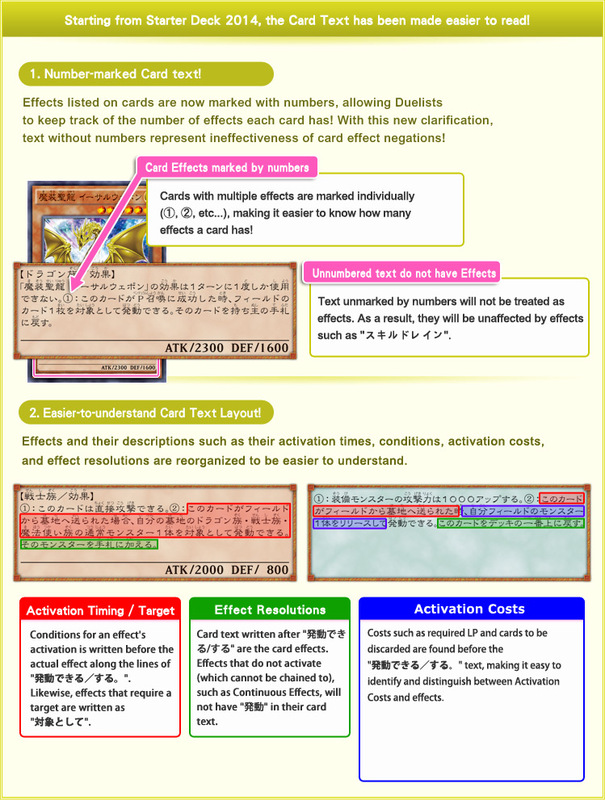 Check out the latest Master Rule 3 taken effect since March 21st 2014, and introduced along with the Yu-Gi-Oh! ARC-V Starter Pack! 1. Introducing "Pendulum Monsters" and "Pendulum Summoning"! 3. Up to 2 simultaneous Field Spells! 4. Simplified Field Zone Names! An all-new method of Summoning! Make use of the Pendulum Monster's Pendulum Scale, unleashing them using Pendulum Summons! Though they appear to be like any other Monsters, they can be treated as Spell Cards by placing them in the "Pendulum Zone" via "Pendulum Summoning"! To do this, you will need to make use of the "Pendulum Scale"! The Pendulum Zone is marked below! Prepare them by placing Pendulum Monsters on both side! Here's how to "Pendulum Summon"! Simply place Pendulum Monsters on both Pendulum Zones! The power of Pendulum Summoning lies in the ability to Special Summon multiple monsters whose level lies within the Pendulum Scales! Invoking this allows easy summoning of high level monsters! ⇒ As they're now treated as Spell Cards, they could be destroyed by cards such as "サイクロン" / "Mustical Space Typhoon". 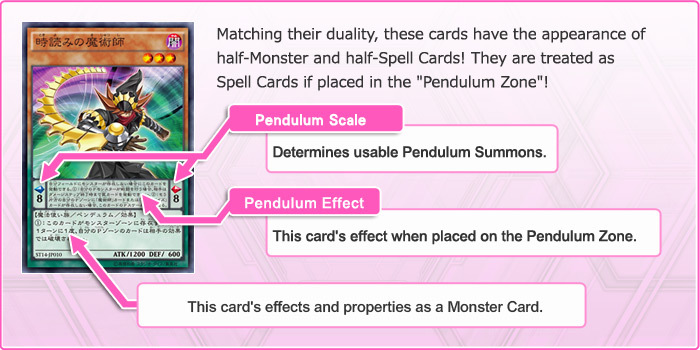 Pendulum Monsters placed in either Pendulum Zone are no longer treated as Monster Cards. ⇒ Cards such as "ブラック・ホール" will have no effect on them. Special Summons can be invoked alongside Pendulum Summons at the same time! ⇒ If a Pendulum Summoning is negated by "神の宣告", all monsters about to be summoned will be sent to the graveyard. The new rule omits the first drawing phase of the first Duelist. Though there are advantages of striking first, the omission of this rule adds another layer of new strategies when going second... which will you choose? 3. Up to 2 simultaneous Field Spells!! Only 1 face-up Field Spell can be present on the field. 1 face-up Field Spell Card may exist on each Duelist's field. Also, an existing Field Spell Card is sent to the Graveyard once a new Field Spell Card is activated in its place on its respective field side. With the introduction of the new Pendulum Zone, some Field Zone names have been simplified! ⇒Duelist announces that they're entering the Battle Phase. ⇒Duelist announces their attacking Monster, and their target. Effects that affect damage calculation such as negations and changes to monsters' ATK/DEF are activated here. Face-down cards are flipped face-up at this step (flip effects are yet to be activated). Monsters' ATK/DEF are compared, with the appropriate damages inflicted. Though uncommon, any effects that are activated during this "Damage Step" will do so here. Resolve card effects activated by battle such as "when you take damage" or "when this card attacks". Card effects which activate when a card is flipped face-up by battle are also activated here. All damage calculations are applied, and destroyed monsters are sent to the Graveyard here. Effects written along the lines of "when destroyed by battle" will be activated. ⇒Duelist announces the end of their Battle Phase.